Difference between revisions of "Padmasambhava"
Now, the thirty seventh king of Tibet, [[Trisong Detsen]], had invited the great pandita [[Shantarakshita]], also known as Khenpo Bodhisattva, to establish Buddhism in his country. The author of the famous ''[[Ornament of the Middle Way]]'' (Skt. ''Madhyamakalamkara'') and ''[[Compendium on Reality]]'' (Skt. 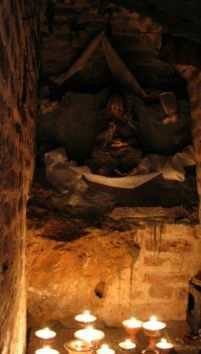 ''Tattvasamgraha''), Shantarakshita began teaching in Tibet, and laid the foundations for Samyé monastery. This provoked the local spirits, who embarked on a campaign of disasters—disease, floods, storms, hail, famine and drought—and whatever construction work was done at Samyé during the day was dismantled at night. 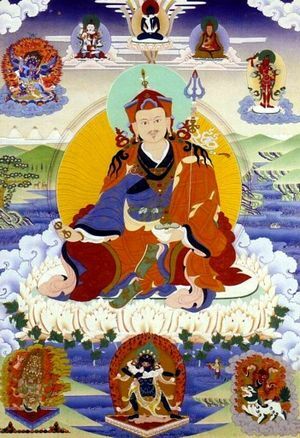 Shantarakshita urged the king to invite Padmasambhava, and he despatched envoys under the leadership of [[Nanam Dorje Dudjom]]. With his prescience, Guru Rinpoche knew already of their mission, and had gone to meet them at Mangyul, between Nepal and Tibet. According to Kyabjé Dudjom Rinpoche, it was in the Iron Tiger year (810) that Padmasambhava came to Tibet. It is said that he was then over a thousand years old. On the way to central Tibet, he began to subjugate the local spirits and made them take oaths to protect the Dharma and its followers. He met the king at the Tamarisk Forest at Red Rock, and then went to the top of [[Mount Hépori]] and brought all the ‘gods and demons’ of Tibet under his command. Now, the thirty seventh king of Tibet, [[Trisong Detsen]], had invited the great pandita [[Shantarakshita]], also known as Khenpo Bodhisattva, to establish Buddhism in his country. The author of the famous ''[[Ornament of the Middle Way]]'' (Skt. ''Madhyamakalamkara'') and ''[[Compendium on Reality]]'' (Skt. 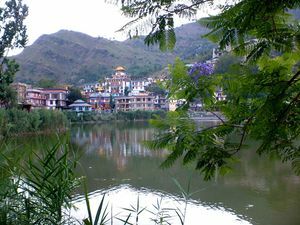 ''Tattvasamgraha''), Shantarakshita began teaching in Tibet, and laid the foundations for Samyé monastery. This provoked the local spirits, who embarked on a campaign of disasters—disease, floods, storms, hail, famine and drought—and whatever construction work was done at Samyé during the day was dismantled at night. Shantarakshita urged the king to invite Padmasambhava, and he despatched envoys under the leadership of [[Nanam Dorje Dudjom]]. With his prescience, Guru Rinpoche knew already of their mission, and had gone to meet them at Mangyul, between Nepal and Tibet. According to [[Dudjom Rinpoche|Kyabjé Dudjom Rinpoche]], it was in the Iron Tiger year (810) that Padmasambhava came to Tibet. It is said that he was then over a thousand years old. On the way to central Tibet, he began to subjugate the local spirits and made them take oaths to protect the Dharma and its followers. He met the king at the Tamarisk Forest at Red Rock, and then went to the top of [[Mount Hépori]] and brought all the ‘gods and demons’ of Tibet under his command. Padmasambhava (Skt. ), or Padmakara (Skt. Padmākara; Tib. Pemajungné; Wyl. pad+ma 'byung gnas) means ‘Lotus-Born’, which refers to Guru Rinpoche's birth from a lotus in the land of Oddiyana. Guru Rinpoche, the ‘Precious Master’, is the founder of Tibetan Buddhism and the Buddha of our time. Whereas Buddha is known primarily for having taught the teachings of the sutra vehicle, Padmasambhava came into this world, and to Tibet in particular, in order to teach the tantras. While Buddha Shakyamuni exemplifies the buddha principle, the most important element in the sutrayana path, Padmasambhava personifies the guru principle, the heart of Vajrayana Buddhism, and he is therefore known as the ‘second Buddha’ (Tib. sangyé nyipa). There are many accounts of Guru Rinpoche’s life, written by great scholars or revealed by the tertöns. 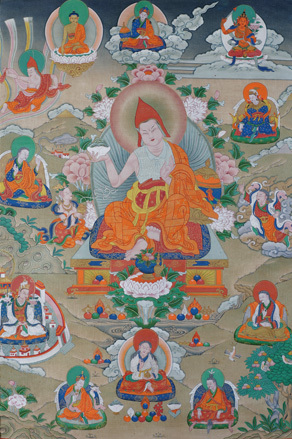 Some of the most famous of his biographies are the Namthar Zanglingma, ‘The Zanglingma Lifestory’, named after the Copper Temple at Samyé where it was discovered as a terma by Nyangrel Nyima Özer, the Pema Kathang or Namthar Sheldrakma, ‘The Life-Story from the Crystal Cave’, revealed by Orgyen Lingpa, the Kathang Serthreng ‘Golden Garland Chronicles’ discovered by Sangyé Lingpa, and the Namthar Yikyi Münsel, ‘The Life-Story that Dispels Mind’s Darkness’, by Sokdokpa Lodrö Gyaltsen. Guru Rinpoche’s life is also recorded in the histories of the different teaching cycles; there exists a famous Indian version compiled by Jetsün Taranatha, and biographies are even to be found in the Bön tradition of Tibet. 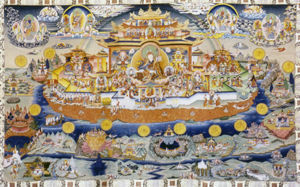 Yeshe Tsogyal, Life and Liberation of Padmasambhava, translated by Kenneth Douglas and Gwendolyn Bays, Dharma Publishing, 2008. Ngawang Zangpo, Guru Rinpoche: His Life and Times, Snow Lion, 2002.